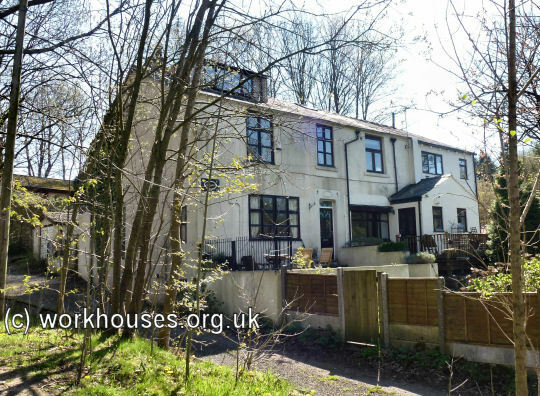 Oldham's first workhouse is thought to have been built in around 1731 at Side o'th' Moor between Mumps and Greenacres on the triangle of land now formed between Lees Road, Glodwick Road and Wilkinson Street. A deed dated 26th August 1731 mentions, "All that newly-erected building bays etc. or housing called the poorhouse or workhouse situated and standing on the common or waste ground called Greenacres Moor within Oldham". In 1776, the workhouse could house up to 60 inmates. Oldham's Side o'th' Moor workhouse site, 1848. ... is an old building, and usually contains about 130 inmates, more weavers than any other class; there are also hatters, colliers, and others. A retired soldier, with a salary of 22l. a year, acts as governor, and is useful to the parish in various other matters connected with the management of the poor. All the inmates who are able to work are employed, either at looms in the house, in cultivating the garden, on the roads, or in the cotton factories; and, in the last case, the manufacturers pay the wages to the township. None but the aged or sick are allowed tea, coffee, tobacco, or snuff. The house, though homely, is clean; and the people seem content with the provisions, which are supplied by tender. They are allowed to go out when their work is done, on asking leave, and the governor said that bad consequences seldom followed the indulgence. There is a complete separation of the sexes, except in cases of old married people, who are allowed to live together: young married persons are separated. Ordnance survey maps of 1844 show local workhouses in Royton, at the top of Mill Lane in Haggate, and in Chadderton, in what is now the area around Stockfield Road. 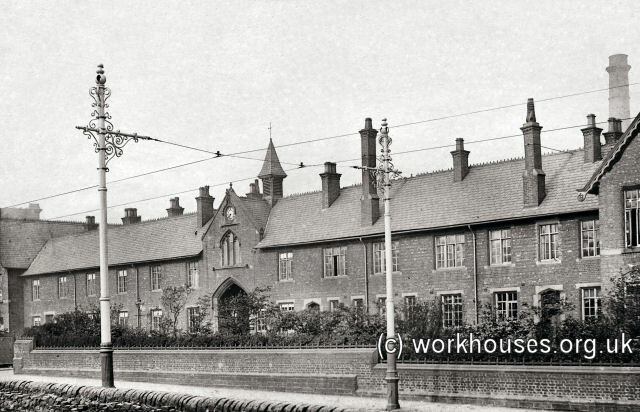 The former Royton workhouse still survives. Rebuilt in 1828, it is now known as Spaw Cottages. The former Royton workhouse, 2015. In 1776, the workhouse at Chadderton (then spelled Chedderton) could house only three inmates. all the inmates, nineteen in number, were crammed in one small sitting roam, the only apartment on the ground floor, the dimensions of which are under five yards square; there are also only two bedrooms, each of the same extent. The afflicted paupers have been so affected by the unwholesome restrictions incidental to such a place and the evil effects of confined air, as to have become almost a mass of disease. Smallpox, cutaneous affections and various other loathsome diseases have so raged that nine out of the nineteen paupers have died in a few weeks. A workhouse at Crompton is shown on James Butterworth's map of Oldham and the surrounding area of 1817. It was situated on Oldham Road in Shaw Side, in the area where Sumner Street and Longley Street now are. There is also supposed to have been a small workhouse at Tonge. County of Lancaster: Alkrington, Chadderton (3), Crompton (3), Middleton (3), Oldham (6), Royton (3), Thornham, Tonge. The population falling within the Union at the 1831 census had been 61,038 with parishes ranging in size from Alkrington (population 367) to Oldham itself (32,381). Oldham, like many Unions in the north of England, was resistant to operation of the 1834 Act and which it argued was inappropriate for the needs of a manufacturing area. In 1837, an attempt was made to elect a Board of Guardians, but a bill-posting campaign by the Radicals dissuaded the inhabitants from voting. Eventually, six Guardians were chosen at a Vestry Meeting, but only two of them ever attended a Poor Law Meeting and by the end of the year they had all resigned. The Oldham Board of Guardians finally met on 22nd September 1847. Their first meeting took place in Oldham Town Hall, and first on the agenda was the subject of workhouses. They considered all of the existing workhouses within their jurisdiction (this is the only surviving evidence of the workhouse at Tonge), and decided that none of them were suitable for continued use. Those at Crompton and Tonge were found to be particularly bad and until new accommodation could be provided, it was decided to retain those at Oldham, Middleton, Royton and Chadderton. 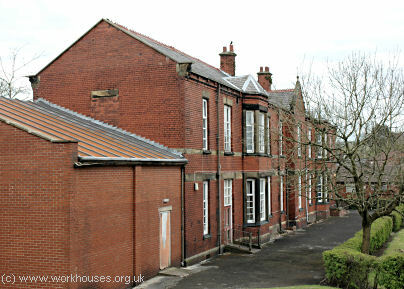 Construction of a new workhouse began in 1848 on at site at Northmoor at the west side of the Rochdale Road. Designed by Travis and Magnall, architects of Manchester, it was completed in 1851 at a cost of £13,305. In 1855, special accommodation for lunatics was built, and in 1877 sick wards were added. A new male imbecile ward was built in 1881 and one for females in 1886. 1886 also saw the construction of a residential school for 350 children at the north-west of the site, together with chapel holding 700, dormitories, wash-houses and a dining hall. Later additions included workshops, kitchens and a boiler house. The site location and layout in 1891 are shown on the map below. 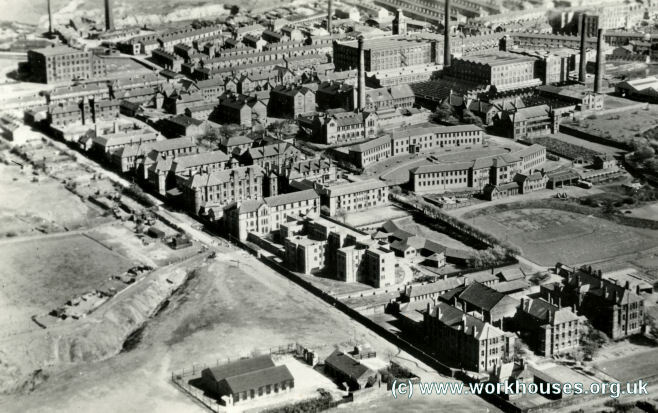 Oldham union workhouse site, 1891. 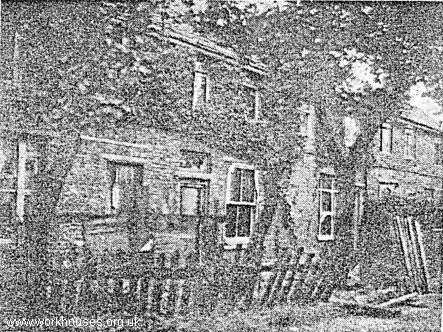 Oldham former workhouse Rochdale Road frontage from the north-east, c.1905. 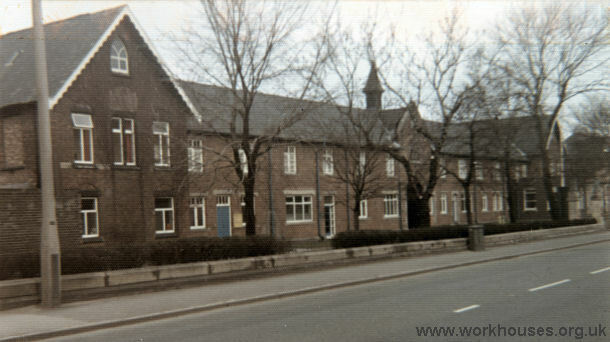 Oldham former workhouse Rochdale Road frontage from the south-east, c.1975. 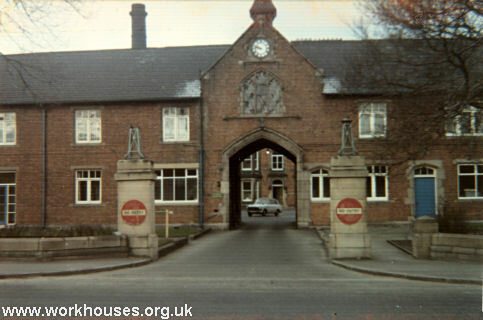 Oldham former workhouse Rochdale Road entrance from the east, c.1975. The two-storey main building ran north-south parallel withe the Rochdale Road frontage. The master and matron's quarters were at the centre with two hundred males housed at the north side and a similar number of females at the south. 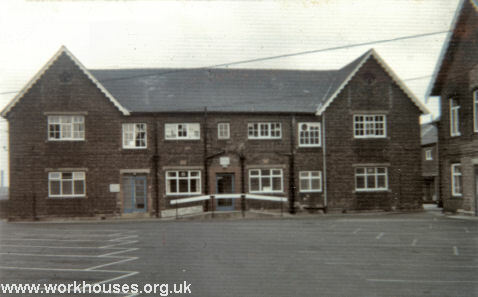 Oldham former workhouse - main block (composite image) from the south-east, c.1975. The main building at the centre of the site had male and female imbecile wards to its north and south, and male and female infirmary blocks at the south-east and north-east. A smallpox and fever ward, dating from 1870, was located at the north-east of the site. 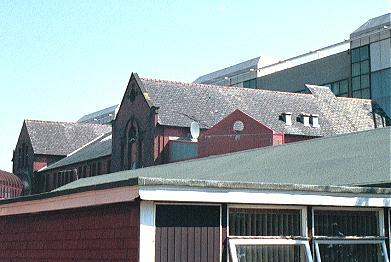 Oldham fever ward from the south-west, 2000. Oldham former male imbeciles' block, c.1975. Oldham former female infirmary block, c.1975. 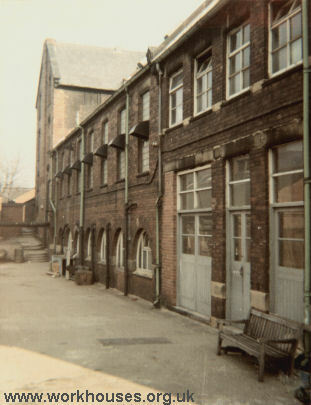 Oldham former workhouse laundry block, c.1975. A hospital with a central administration block flanked by male and female ward pavilions was located at the north of the site fronting onto Sheepfoot Lane. As well as the Master and Matron, normally husband and wife, various trade directories and almanacs also regularly list a chaplain and surgeon amongst the staff. A schoolmaster appears in the list of staff in 1863 indicates that educational provision was made for children in the workhouse prior to the construction of the school in 1886. In 1893, with the school up and running, a Superintendent and a Matron of the school are also listed. Other staff filled a variety of more menial tasks, and photographs of the workhouse from the 1890s show a number of women in nurses' uniforms. In 1894, having received instruction from Inspector Harrison of the Oldham Corporation Fire Brigade, a number of the staff combined to form the Workhouse Fire Brigade. About one-fifth of the inmates are Roman Catholics; about half the remainder are Dissenters, and the rest belong to the Church of England. All the inmates who are able to do so, go either to church or chapel out of the work-house on Sundays. A clergyman of the Church of England voluntarily performs a service in the workhouse on Sundays. "Town missionaries" visit the workhouse daily. The ventilation of this workhouses very imperfect, and the defect is immediately perceptible to the senses upon entering the wards. Many of the wards are close, dark, and gloomy. None of the skylights are made to open; they are all firmly closed so as to exclude the air. The waterclosets are so imperfectly constructed that much of the foul air arising from them is drawn into the wards. The children of both sexes are all quite young and small. They readily obtain employment, as soon as they are old and strong enough; the boys go to the coal pits and factories; the girls become "nurse girls" and domestic servants. When not in school, these children, boys as well as girls, are partly under pauper superintendence. The men sleep together two in a bed, a must objectionable custom, and one that I hope to see entirely done away with very soon in this district. Smoking tobacco by the women as well as by men is prevalent in most of the wards here, as in many other workhouses in this district. A woman who had been blind from her birth, complained to me, though with much apparent hesitation and reluctance, that the pauper superintendent of the ward, of which she was an inmate, abused, swore at, and ill-treated the infirm women under her care; I inquired into the complaint, and came to the conclusion that it was well founded. The other inmates of the ward whom I questioned assured me that the superintendent ill-used them constantly; they seemed quite in fear of her. After consulting with the master and matron, it was arranged that this woman should be immediately superseded and removed from the ward, and her place filled by some one else. There is a detached infirmary at this workhouse, and these are also detached wards called "fever wards"; there are no convalescent wards in either of these places. The number of sick and others requiring medical attendance at this time is eighty. Some of these cases, owing to the want of room, are pieced in the ordinary sleeping wards, occupied by healthy persons in the main building. The nursing, attendance, and general management of the sick in these wards is insufficient and unsatisfactory. Efficient nurses are urgently required, and they should be superintended and guided by a person of superior intelligence. The sick are not always supplied with separate beds; in one ward two old men were in the same bed together. In another ward I found together a girl 13 years old afflicted by a "urinary complaint," a woman with "itch," a child four years old with "whooping cough," a middle-aged woman with "venereal disease," and an aged woman who, from infirmity, was unavoidably of extremely offensive habits. Into these wards was lately sent a case of cholera, which shortly afterwards terminated fatally. The convalescent patients from the fever wards are sent to the infirmary, and they mix with the other patients there. There are no proper dining tables for those who are able to sit up and take their food. Consequently, they are obliged to place their plates upon the beds, their knees, their seats, and on the tops of the night stools. Tables and table linen are much required. In January 1887, the workhouse became the centre of a sensational murder case involving workhouse nurse Elizabeth Berry who was accused of poisoning her eleven-year-old daughter Edith Annie Berry. The mother was found guilty and was hanged on 14th March, protesting her innocence until the end. In 1894, the British Medical Journal set up a "commission" to investigate conditions in provincial workhouses and their infirmaries. Following its visit to Oldham, the commission's report was largely favourable. Amongst its small number of recommendations were the provision of a labour ward separate from the lying-in ward, and an increase in the nursing staff, especially for the children. Further details are available in the full report. From 1904, to protect them from disadvantage in later life, the birth certificates for those born in the workhouse gave its address just as 449 Rochdale Road, Oldham. From 1915, the workhouse was renamed Westwood Park Poor Law Institution. 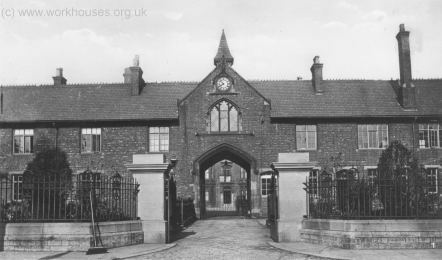 Following the inauguration on the National Health Service in 1948, the former workhouse infirmary at the north of the site became Boundary Park General Hospital. The rest of the buildings were renamed Boundary Park General Hospital Annexe, specialised in providing geriatric and psychiatric care. An Oldham County Borough Directory of 1956 lists Boundary Park Hospital as having 390 beds, and the Annexe as having 600. However, the establishment of the modern Welfare State meant that there was less need for the services provided by the Annexe and greater need for more hospital beds. When the last forty old men and women left the Annexe in 1957 for residential care, they were seen as the last 'inmates' of the old workhouse. 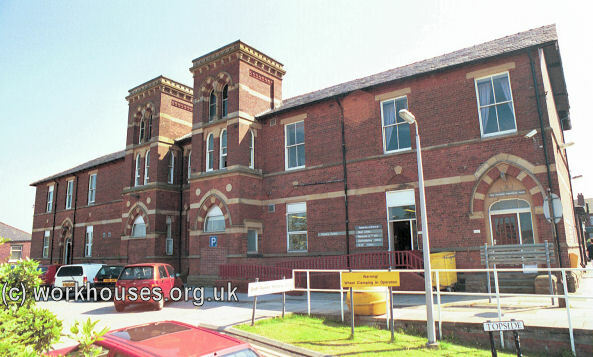 The old buildings continued in use for many years as part of Oldham and District General Hospital. In 1981, the large scale demolition and reconstruction of the hospital began, and on 1st December 1989, the Royal Oldham Hospital was officially opened on the site of the old workhouse. Few of the early workhouse buildings remain. Those that do are largely engulfed by modern buildings. Oldham from the south-west, 2000. 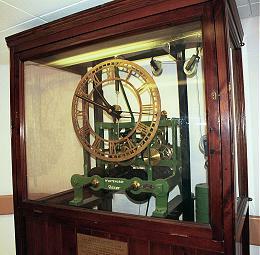 One survivor of the old workhouse is the clock from above the entrance whose mechanism has been preserved. 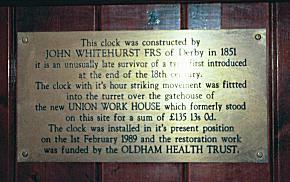 Oldham workhouse clock description, 2000. In 1903, the Guardians decided that all children over the age of two should be removed from the workhouse and housed instead in scattered homes. The homes were located at 1 Low Crompton Road, Crompton; Coldhurst; Freehold; 16-18 Mayall Street, Greenacres; Hollins; and Middleton. Each home housed between fifteen and twenty children and was run by a house-mother. The children attended normal schools, but were expected to help with chores in the home. Children over five were separated according to religion (Catholic or Protestant) and gender. Children between the ages of two and five were housed in the home's nursery. 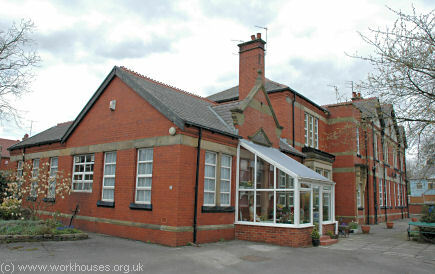 The headquarters of the homes was at 'Fir Bank' on Fir Bank Road in Royton. Fir Bank was erected in 1898 and designed by the partnership of Wild, Collins & Wild. The site included a receiving home at the west of the site for new children, a separate infirmary at the east, and a superintendent's house. It could accommodate a total of 115 children. The site location and layout are shown on the 1910 map below. Royton Homes receiving block from the south-west, 2005. Royton Homes receiving block from the east, 2005. 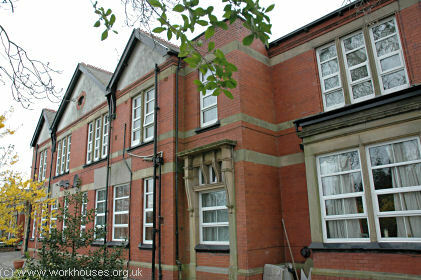 Royton Homes infirmary from the north-east, 2005. The former Fir Bank receiving home has now been converted into flats. The infirmary site is now occupied by the council's special educational needs department. Oldham Local Studies and Archives, 84 Union Street, Oldham, OL1 1DN. Extensive holdings include: Guardians' minutes (1847-1930); Admissions and discharges (1871-74, 1878-1950); Births (1847-1931); Deaths (1887-94, 1917-48); Creed registers (1891-1959); Children received and detained in the workhouse (1910-41); etc. Talbot, Carol (2013) The Amazing Higgs — a fictionalised account of the life of the remarkable Mary Higgs (more details and copies available direct from the author). 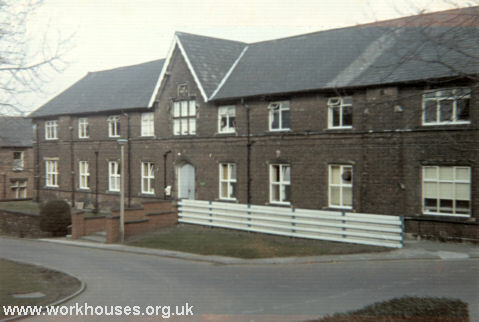 Thanks to Martin Luke for the 1975 pictures of the workhouse buildings. Thanks also to Oldham Local Studies and Archives for information on the Oldham workhouse.